Review: Mostly, mangas manage to portray a battle of wits between two opposing parties in a very unique way. The reason being that there is a specific set of rules and you have to act within its boundaries. 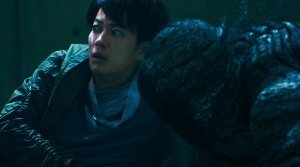 "Ajin: Demi-Human" may not be as intelligent as "Death Note", but there still are some nice surprises. In addition, the action sequences also manage to convince the viewer. Nevertheless, it is still hard to give an absolute recommendation for the movie. The plot is pretty shallow and could have used a larger scale. Everything should have been more epic, more world-comprising. In the end, it is just a battle between the two protagonists and a few other people on their sides. 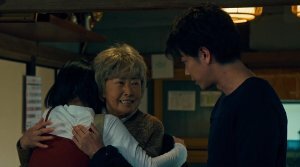 In fact, this could even have been the movie's strength, as by focusing on just a handful of people, the emotional bonding between them and the audience could have been even stronger. Unfortunately, that's exactly where the movie falls short. Based on a manga by Gamon Sakurai this story struggles with the fact that it is missing heartfelt depth. There are some quite dramatic aspects hidden in the story. Seemingly, Sato is the bad guy, but as soon as you realize how much torture he went through, you understand his all-consuming hatred. But does the plot use this aspect? Nope. Sato is not the pitiful antagonist, who at least sometime gets our compassion. He is simply used as an instrument for the predictable plot, where at the end there has to be a confrontation between him and Nagai. Gou Ayano ("Rage") even manages to be charismatic at that and convinces with his action sequences. 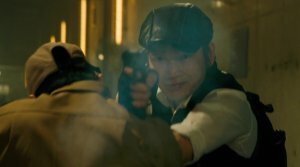 The scene at the beginning is especially eye-catching because of its outstanding Gun-Fu, and that's why it is even more surprising that we don't get to see more of it in the rest of the movie. But let's stay with the characters for a moment, specifically Nagai, who is the center of the story. He seems rather distant, but as we can see with the side plot about his sister, he is also pretty warm-hearted. But that's basically it. He does not have any identity crisis - which is to be expected if you find out that you are immortal and that you won't be able to live a normal live anymore - and he accepts his role as a super hero too quickly. In the end, he is the one who manages to put obstacles in Sato's way with some clever plans. But why him and not the task force, which was specifically created for that purpose. And why do they leave the real nerve gas with the president and not just a decoy. There are some irrational decisions within the script, however Nagai could have hidden these flaws if only he would have been allowed more depth. 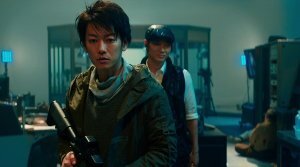 At least Takeru Satoh ("Rurouni Kenshin", "If Cats Disappeared from the World") manages to cover up his character's bleakness with his charm. Moreover, there is no room left in "Ajin: Demi-Human" for the minor characters. Even if you have not read the original manga, you can see that they have been cut down or left out completely. The relationship between Tosaki and Shimomura is fascinating. How did she become his bodyguard, what is the background story there? And is there more to Okuyama and Tanaka, apart from them being Sato's sidekicks? Probably, but we never get to know anything about that. And this is problematic, as the movie doesn't manage to deliver a great story otherwise either. Therefore, the focus inevitably shifts to the action sequences. Which are really impressive most of the time. 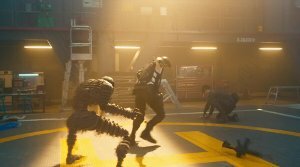 The choreography of the fight sequences match the special circumstances, as it is important to kill oneself in the right moment of the battle to "reset" and regenerate within seconds. You have to be able to get used to these conditions, but since "Ajin: Demi-Human" constantly makes references to video games (too many references to be honest) this shouldn't be a problem. Apart from their ability to regenerate, Ajin are also able to conjure ghost-like creatures, who fight on their sides. As for the "How" and "Why" we do not dare to ask anymore. Nevertheless, this makes the fight scenes even more extraordinary and leaves room for some surprises, and in fact the CGI is mostly not that bad, actually it is even quite nice. 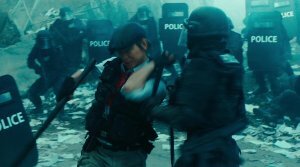 The battles are accompanied by a fast-paced, sometimes dubstep-like soundtrack and the entire movie is in fact so fast-paced that we are surprised once we have already reached the finale. It is light entertainment, which manages to convince with good action sequences, but always keeps the audience at a distance, because the characters haven't nearly been fleshed out as much as the story would have deserved. It's a shame that "Ajin: Demi-Human" is only mind candy, the plot would have offered more than that.